Looking for an activity for your next Professional Activity Day? Enjoy a guided tour of the McMichael’s world-renowned art collection and a presentation highlighting the McMichael’s school programs. As a bonus, an additional 10% discount will be offered to all participating teachers if a school trip is booked within two weeks of this visit! Make the most out of your visit and stay for lunch. For reservations, please call the on-site restaurant, Aura by Cashew & Clive, at 905.893.1121, ext. 2262, or email restaurant@cashewandclive.com. 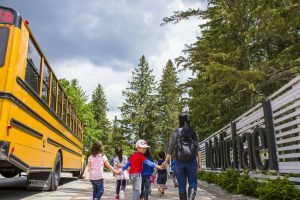 The McMichael offers teachers the opportunity to view new exhibitions and learn about school program offerings at no cost throughout the year. To receive more information on these events and the latest news, please sign up for the Ed Flash e-newsletter by sending an email to Erica Mogentale, Creative Learning Coordinator, at emogentale@mcmichael.com. The McMichael offers special Teacher Retreat packages which include facility rentals and/or catering as well as Tours and Professional Development options. Please inquire by contacting Angela Poletto, Sales Manager, at apoletto@mcmichael.com.